Please find the news from our beautiful preschool! A.G.B.U. Manoogian-Demirdjian School has offered Advanced Placement (AP) classes to high school students since 1991. The College Board’s Advanced Placement Program® (AP®) provides motivated and academically prepared students with the opportunity to take rigorous college-level courses while still in high school, and to earn college credit, advanced placement, or both for successful performance on the AP Exams. 81 students out of our 135 10th through 12th grade DHS students were enrolled in one or more AP classes and took the exams in May of 2015. These students were exposed to the valuable experience of taking a college level class while still in high school. We are pleased to inform you that the overall passing rate for all AP exams averaged together is 75%. Following is a summary of the AP exam scores in each subject. Click on the news item to read further! 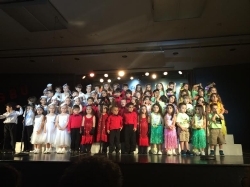 Artemis Nazarian Preschool Annual Program was held on Saturday, May 10th. It was a memorable day filled with joy of seeing our students’ accomplishments and graceful performances. ANP-3 students were dazzling on the stage with their beautiful costumes and Armenian dance moves, as well as their welcoming remarks in both languages. The older groups proudly and confidently took over and brightened the stage with Hawaiian, Chicago and last but not least Armenian dances, recitations and tastefully selected Armenian and English songs by Mrs. Marine Kelian. Flowing and charming singing of children was the finale of two successful events in a day. In closing, Mr. Hagopian thanked all the teachers for their dedication and invited them to come forward to be recognized and to receive beautiful bouquets of flowers from homeroom mothers, as a token of appreciation. A delightful reception followed each program. AGBU MDS PARTICIPATES IN THE 2013 GREAT CALIFORNIA SHAKEOUT! This morning at 10:17 AM, all AGBU MDS students and faculty joined millions of people in California to "Drop, Cover and Hold On" in order to access our preparedness for an earthquake. 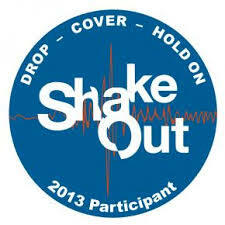 Our school is registered and will report the result of our drill to the Great California ShakeOut.